West Ham executed a devastating counter-attacking display at Craven Cottage to beat basement side Fulham 2-0 on Saturday. 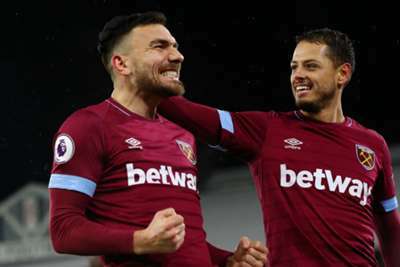 The Hammers' fourth consecutive Premier League win was all but secured before half-time, with Robert Snodgrass and Michail Antonio on target as Fulham's flaws were laid bare in the London rain. The struggling hosts wasted several clear-cut early openings while West Ham ruthlessly punished the gaping holes in a defence still waiting on its first clean sheet of the campaign. There was no way back for Fulham and they remain bottom of the table ahead of a potentially pivotal run of fixtures in which they face Newcastle United, Wolves and Huddersfield Town. A painful opening half an hour for Claudio Ranieri saw Fulham repeatedly squander chances at one end before conceding twice on the break at the other. First, Aboubakar Kamara shot too close to Lukasz Fabianski, before Snodgrass dispatched a fine effort high past Sergio Rico. Further opportunities for Aleksandr Mitrovic and Kamara drew only routine stops from Fabianski and West Ham, by contrast, were clinical, Antonio controlling Javier Hernandez's cute flick and nutmegging the goalkeeper. Antonio's goal seemed to dishearten Fulham, whose threat waned, and a second half of little incident saw the visitors cruise to victory to move up to ninth. Ranieri's first big task at Craven Cottage was to fix the division's leakiest defence, his second was to get Fulham scoring again. The hosts were dismal in both penalty areas on Saturday and, with key fixtures fast approaching, swift improvement is still required. Meanwhile, West Ham's early season concerns appear to be no more. This was another assured away performance. Any doubts about Felipe Anderson's suitability to the Premier League have surely long since evaporated. Here, in miserable conditions, he ran the show for the counter-attacking visitors. The Brazilian teed up Snodgrass' opener and then delivered a cross that drew two defenders towards Hernandez for the second. It's very cold here at Craven Cottage and it's pouring with rain, but we've seen few nice touches early on from Felipe Anderson. Kamara has never been the most reliable in front of goal, but he should have come into this game full of confidence after netting in consecutive matches. Instead, some woeful early finishing handed West Ham the initiative, with his first effort - saved well by Fabianski - setting the tone for a miserable evening. - West Ham have won four consecutive Premier League games for the first time since February 2014. - Fulham have not kept a clean sheet in any of their last 21 Premier League games, conceding at least twice in 18 of those games (53 goals in total). - West Ham's Robert Snodgrass has been directly involved in five goals in his last four Premier League games (2 goals, 3 assists), after previously going 16 games without a goal or assist in the competition. - Following his assist today, Felipe Anderson has been involved in more Premier League goals this season than any other West Ham player (8 – 6 goals, 2 assists). - Javier Hernandez's assist for West Ham's second goal was the Mexican's first assist in the Premier League since April 2014, when he set up Juan Mata for Man Utd vs Newcastle. Fulham face a huge trip in more ways than one next week when they visit Newcastle. West Ham have a mid-table tussle with Watford to look forward to.